Real time monitoring of your jobs. Monitor, revision and validation of the CAD designs. Follow-up of the material sent to the laboratories (attachments, etc.). Improve the planning of smiles. Budgets affordable for patients, revealing the total cost of the prosthesis. Record of all the jobs done by the laboratory. Control and monitoring of the tests. Exchange of CAD files (intraoral scanner) and photos of cases. Elimination of paper in clinics. Information delivered 100% through digital flow. 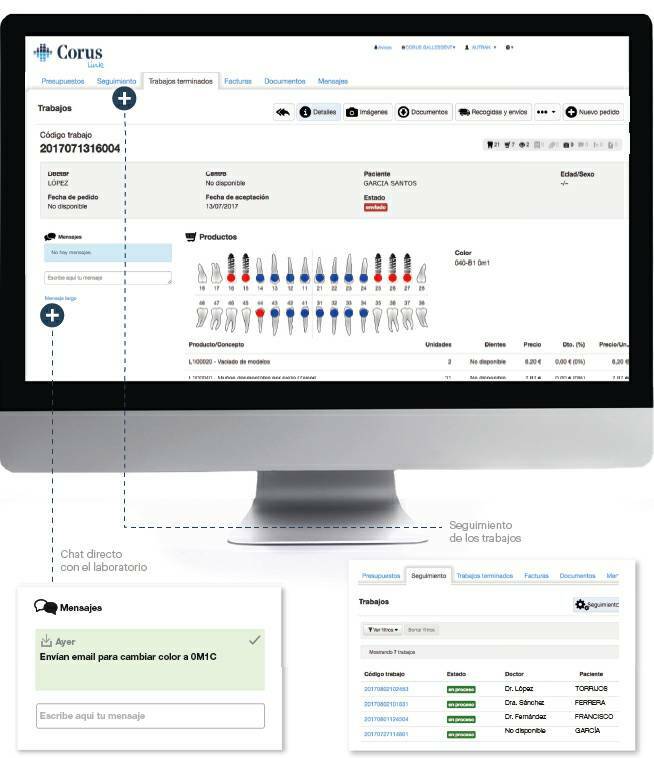 Instant communication in real time (chat) for each job between clinics-laboratories. Management on non conformities and constant improvement. Web platform with no instalment. Unlimited accessibility: from multiple platforms and at any moment. Mobile App for consultations and follow-up. As a new job is introduced, a budget for the patient comes out. A full 100% digital flow of information, reducing the management time of the team. The images can be downloaded directly to the platform to validate the CAD designs. A real time chat with the laboratories to make consults about a job and obtain complete traceability of each prescription. A permanent follow-up of each job´s state and also can download invoices and delivery notes at any moment.